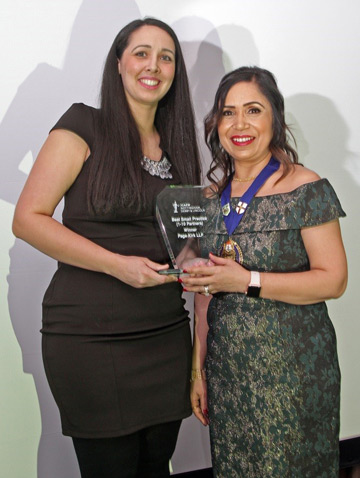 Nottingham-based accountancy firm Page Kirk LLP claimed a prestigious award at the regional district of the Institute of Chartered Accountants in England and Wales (ICAEW) awards, which recognised their outstanding work in the East Midlands finance sector. At a special awards dinner at Georgian country house Eastwood Hall, the Page Kirk team were told they had won the ‘Best Small Business’ prize, which is open to practices of between one and ten partners. Rachael Cobb, Head of the Accounts Department, received their trophy in front of a 250-strong audience of accountants and guests. Page Kirk fought off fierce competition in a category which was shortlisted through nominations with the ICAEW regional district committee and recruiters Michael Page crowning the ultimate winner.